West End Walks. 2 interesting little places. 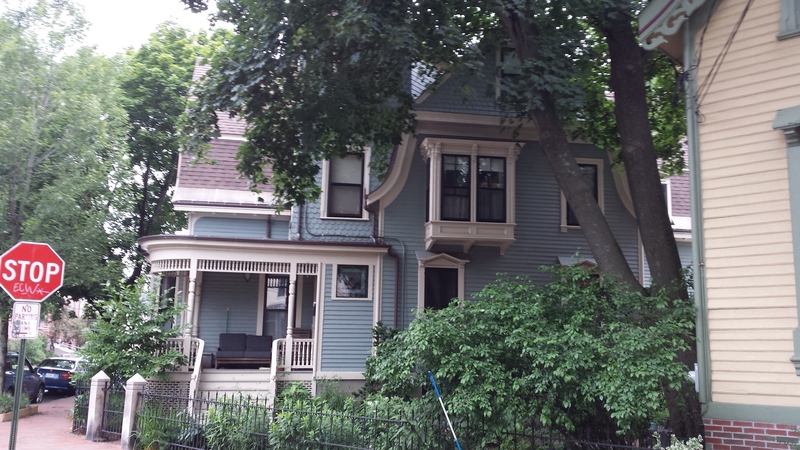 137 Emery is a 2 story mansard with a second story wing over a coach port. A design element I have not seen used in the area before. I suspect that room above the port gets mighty cold. in the photos. The house its self seems to be in pretty good shape. The entrance presents a variety of surfaces and shapes that, although seemingly tossed together at random, combine to create a welcoming scene. The use of vine covered lattice on the corner of the coach port is a nice, softening touch. The north side shows a long wall broken by several windows. Interestingly, the front bay has no windows at all. Given the inclusion of windows on the remaining wall space, one wonders why this was left as solid wall. The diamond windows in the second floor gable are a period detail. I note the front one is closed up. That and the barely visible vent stack on the roof make me think a bathroom on the second floor. The vent by the front first story window may be for a dryer. The detail of the corner board and claps are interesting. The corner has an almost complete circle in plan, only 15 or so percent being connecting to the flat edges. The claps have a beaded edge that is quite uncommon. 94 Pine is a classic towered Queen Anne house of the 1850’s & 60’s. Covered in claps and shingles of varied patterns and showing bumped out bays and curved window ledges of the tower, the building practically dripping with details. The tower is nicely proportioned with a well scaled roof capping it off. The only thing detracting from the appearance is the awkward handling of the roof lines over the gables. More on that subject below. The current color choices are okay if a bit staid. The white being much too brilliant against the more pleasant blue. The curved porch is a nice feature that reminds of the days when people would stroll in the evening and stop and chat with their neighbors. Perhaps the couch means the residents do spend some time there. An interesting note in the corners of the bay on the street show a semi-circular plan form much like 137 Emery next door. These show much more detailing than next door. Although the house is cute and well maintained, the real story is it’s history. Built in 1863 by James Tenney, the house started it’s life much as we see it today albeit a full 3 stories tall. By 1901, ownership of 94 Pine had been transferred to one Enoch Hunt. Hunt was a local builder and something of an architect. Hunt remodeled the home and increased the height to 3 1/2 stories. This alteration can be seen at the left in the 1924 tax photo below. At a later date the 1901 alterations were removed and the house gained the current form. Henry A Peabody owned the house in 1924. Valuation was $7900.00. The current valuation is $428,600.00. This entry was posted in Architecture, Emery Street, History, Images, Pine Street, Survivor, West End Walks and tagged Architecture, History, images, Maine, Portland, Queen Anne Style, walking, West End on August 1, 2015 by alewifecove.